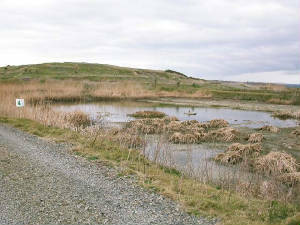 Habitat: Constructed wetland with settling ponds and marsh habitat. Main interest: Waterfowl and waders. Regular/annual: Green Sandpiper, Water Rail. Scarcer species & rarities: Garganey, Hen Harrier, Ruff, Wood Sandpiper, Little Gull, Water Pipit. Access: Approaching from Waterford city on the main Cork road, turn left at the Sweep junction just before Kilmeaden village, then take the first right-turn and continue on for 1 km or less; where power-lines cross the road, a small access road to the right leads to the site. These constructed wetlands were designed to treat creamery effluent, and provide a series of pools, some of which may be flooded, others of which may have lower levels (providing exposed mud), at any one time. Large numbers of Moorhen are resident, and Water Rails also occur in the marshes. A good mix of dabbling duck (including Shoveler) occurs in winter, and Garganey has occurred as a migrant. Large numbers of Snipe occur in winter, and Green Sandpiper may occur in almost any month. Passage waders have included Ruff and Wood Sandpiper, and there is potential for rare species. Sedge Warblers breed in the marsh habitat here, and small numbers of Chiffchaffs winter. 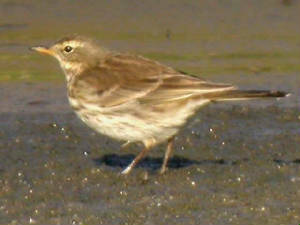 Water Pipits have occurred in winters 2003/2004 and 2004/2005, up to two birds each winter, and the marsh habitat here seems to be ideal for the species. A few Choughs are occasionally recorded feeding nearby (c.10 km inland). Last updated 30 March 2005.